Despite the disclaimer above, I generally try to avoid spoilers in my reviews. 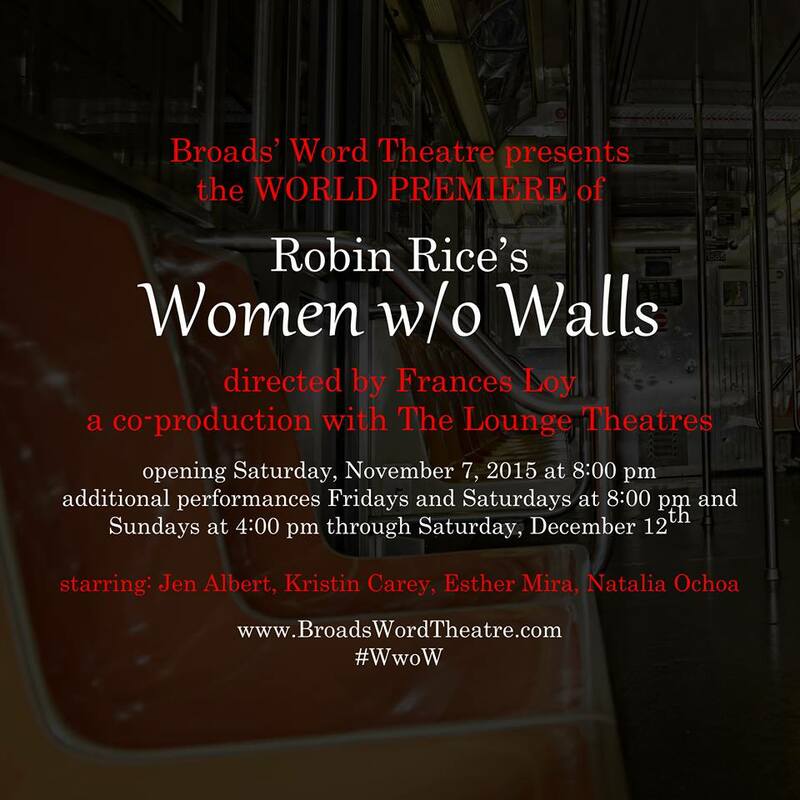 But for Women w/o Walls, that might be something of a lost cause. The central conceit at least becomes obvious (or so it seems) fairly quickly. But that doesn't matter so much with this play by Robin Rice. A subway train, with a single passenger known only as Nurse (Kristin Carey-Hall) knitting away. She refers to herself in the plural--"we" and "us"--but this doesn't sink in at first.One more clue in fact as to where we actually are. Soon enough a young woman named Pamela (Esther Mira) becomes the only other passenger, and seems baffled about where she is going or how she got here. More, Nurse apparently knows quite a bit about her. 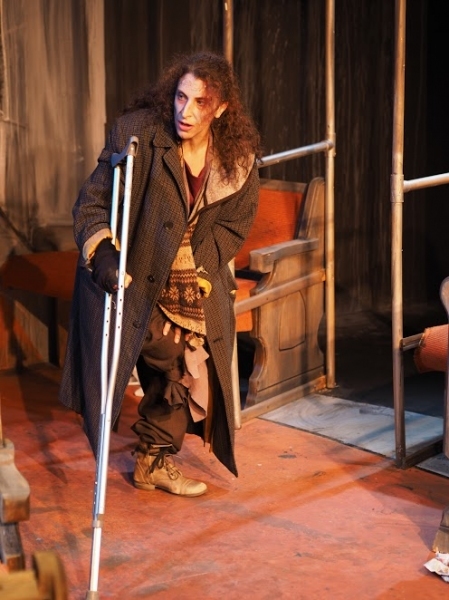 Inez (Jen Albert) a homeless woman with only one leg--literally on her last leg--enters and immediately recognizes Nurse. This, they agree, is her final trip, and it soon turns out she sees Pamela as her last chance at love. In another age, the subway would be a boat crossing the Styx. We are in between life and death. Nurse (in a nice echo of the Fates) is "on staff" and perfectly willing to ease everyone's passage. Within limits. 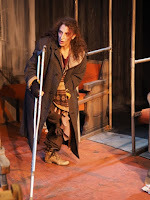 No malice here, but quite a bit of ruthless wisdom--very much needed as Tank (Natalia Ochoa) joins them, a street tough girl with at least one addiction, to music, and a hair trigger. Of course stories about death are really about life. We all know that, right? We all know oblivion is dull, hardly the stuff of story telling. But love, regret, fear, self-awareness, memories, forgiveness, rage, imagination--these are the blood and bones of any (and all) good theatre. These things we get in spades. Technically, this makes for quite a nice piece in many ways, not least because it will surprise you while making all the sense in the world. Higher praise rarely comes out of me than those words. In this case, there's more to come. Because like one of the very best episodes of The Twilight Zone or maybe The Outer Limits, this script builds on a myth to create a new one. 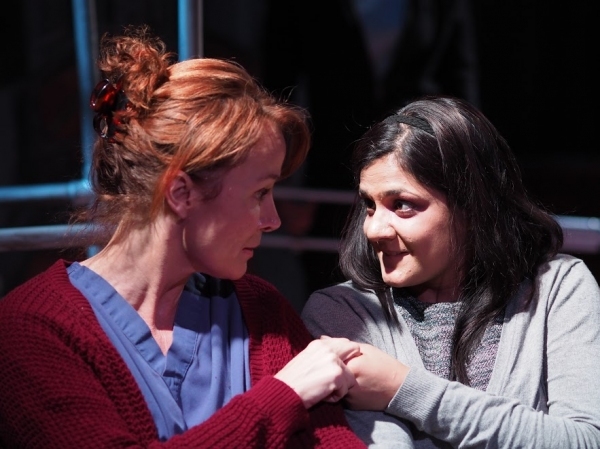 I loved for example how the play eschewed the obvious trinity of virgin/mother/crone--or perhaps subverted it is a better way of describing what happens. One of our passengers for example is defined more than anything else by a troubled (but hardly vicious or even neglectful) relationship with her father. The diseased almost-hag makes her greatest impact not in terms of her age or supposed wisdom, but rather because she's in her heart of hearts still a maiden--still searching for the ephemeral connection of a soul mate. The tough grrl, she doesn't really fit any of these three archetypes. Yet she fits within this story like a glove. Likewise we conspicuously lack (to those devoted to symbolism following the usual grooves) anyone middle class--unless one counts the Nurse. One looks in vain for more than a few overt references of legends of ancient days and nights. Yet the play becomes a legend--infusing such lovely details as an imaginary tea set, or the color to be chosen amongst many balls of string with telling power. All of which would excite only the mind were it not for the cast and direction (from Frances Loy). Were these characters not real, I would not have cared. If Inez' basic humanity didn't touch me, how could I have found myself hoping she won Pamela's heart? Had Pamela not seemed to contain the depths to make that at least a possibility, that hope would have died pretty quickly. 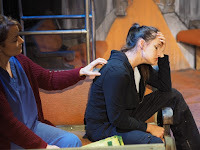 Tank likewise could have come across as nothing more than an annoyance--the type one often does encounter in mass transit, not coincidentally--but whatever hungers drove this girl came across as genuine, raw, and born at least in part from some pain that felt familar. In the end, just before the play ended--and I mean less than ninety seconds before the lights faded--I saw how it would end. This is not a criticism, but praise. All the words and performances and the rest had opened my eyes to let me know what the ending would have to be, must be, naturally flowed from every detail. And my reaction? My hand went to my mouth, a tear welled in my eye, and in my mind the words "Yes, of course" echoed. The revelation stood revealed, complete. And Was Good. 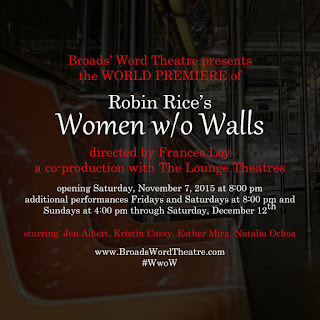 Robin Rice's Women w/o Walls runs Fridays and Saturdays at 8pm, Sundays ata 4pm until Saturday December 12, 2015 at the Lounge Theatre 6201 Santa Monica Blvd, Los Angeles, CA 9003. Tickets are a mere $22 and worth every single cent. Or you can purchase reduced price tix at Goldstar.